Everyone's welcome at our 300 site resort where you are treated to exceptional amenities and a fun-filled atmosphere. Our activities director can keep you busy or you can just relax at our screened and heated pool and spa. 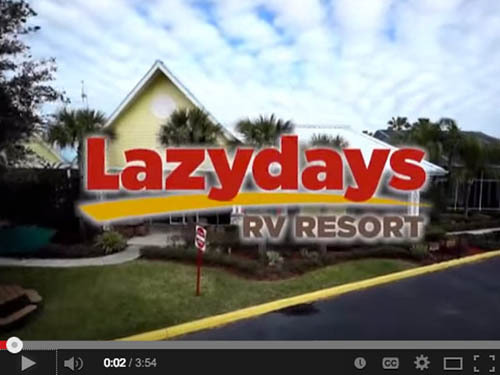 This is our third stay at Lazydays RV Resort. It suits our purpose well (overnight stay on our way to Ft. Myers - easy access to Hard Rock Casino). But their sites are definitely NOT as advertised. We paid for a 45 foot site - our 40 foot MH barely fit with absolutely no room for our tow vehicle. Last year the site had a drop-off at the back that you had to be careful not to back over - this year there was a hill at the back of the site that if not careful would back into. We will continue to stop here as it is so easy in - easy out. But if you stay, just be aware that the sites are shorter than advertised. We purchased a travel trailer on the east coast of Florida and this was our shakedown adventure to test everything. We were extremely happy with Lazydays. I was perfect for our shakedown with the RV store right on property to grab the things you need / forgot. The park was VERY dog friendly a big plus for us. Getting in and out of the park was a breeze (right off I-4). We will go again. No restroom rating because we did not use them. This is a nice park, but the main draw for us is we were waiting for a part to repair our trailer. It is near Hillsborough State Park. As an RV park, Lazydays has a great pool and hot tub enclosed in a birdcage. There's a nice little restaurant and other nice amenities. I was disappointed with the facility. Tight spaces with no place to park tow vehicle. Overpriced. Have stayed at much nicer facilities with concrete pads for half the price. Stayed here when returning from the Keys. Sites are well set up. Easy access with full hook up. Down side you need two black water hoses to reach their drain. Nice pool and nice game center for all. It included giant connect four, giant jenga, pool table, ping pong table, foosball, and darts. Nice dog park. RV store has most items you need other than food. This is a well kept very clean campground. Sites are a little small and there is no shade but roads are wide and everything is paved. WiFi is OK. The most of the staff is very helpful. There is a pool which is screened in and clean. There is a bar/restaurant on site with good food. There is a shuttle service which takes you to the LazyDays RV dealership and service center which is across the street. The service center and sales office is clean with very friendly employees. You can walk around a view all the new and used RV's that are in stock. I personally have mixed emotions with the service center. They take a long time with repairs and don't always fix your problems properly. 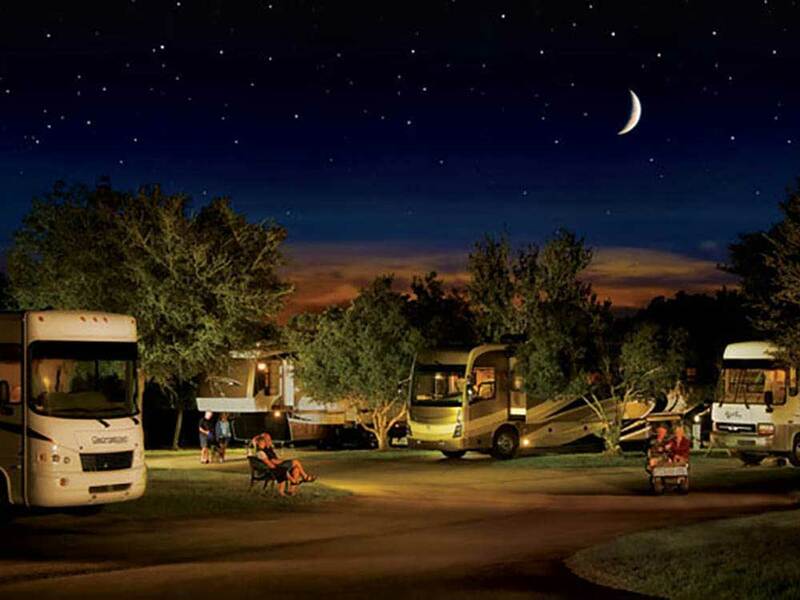 A wonderful RV park, especially if you would like to look at many, many new and used RVs for sale. Nice on site restaurant as well as decent complimentary breakfast/lunch in their cafeteria. Not much shade, but nice pool and hot tub. This is truly a five star RV park with all of the amenities. It is kept very clean and the staff is unbelievably helpful and friendly. They rent bikes, golf carts, and have a shuttle service for those with no dinghy or means of traveling once you get to the park. It is a vacation destination in and of itself. Very, very accommodating to families with Pets ! Can't say enough about this park. The pool, hot tub, showers, and laundry room are exceptionally clean and well serviced. They have a bar and restaurant on site. They also serve breakfast and lunch free to campers at the main sales area. There is a well stocked parts and accessory store within walking distance as well as a Cracker Barrel Restaurant. Trolley service is provided to both of these amenities. They do their own trash pick up as a service. Security is inconspicuous but present. The daily newspaper is delivered to your site each morning. There are two dog parks on the property as well as a large playground for the children. There is a free ice machine in the pool area. My wife and I can;t say enough about this Park, it is truly a vacation destination for us. Thanks Lazydays!!! Would highly recommend to all campers!